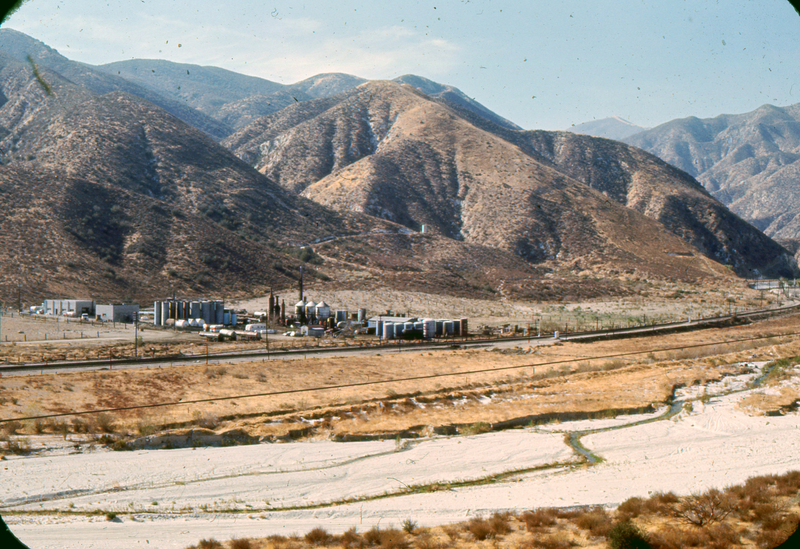 Soledad Canyon sand and gravel mining operations near Lang Station in Canyon Country. Hand-dated color transparency (slide film), November 1970. The view is from the approximate location of the present-day Stonecrest tract. Ever since Francisco Lopez unearthed his famous gold nuggets in Placerita Canyon in 1842, Santa Clarita Valley residents had a history of scouring the local hills for any exploitable natural resource, be it gold, oil, copper, uranium or myriad other materials. While oil flowed throughout the south side of the valley from Pico on the west to Placerita on the east, the Soledad corridor was rich in minerals that lent themselves either to surface or hard-rock mining — from shallow borates in Tick Canyon to deep gold-bearing quartz veins in Acton and even green moss agate gemstones at Ravenna in between. As noted in a report from the federal Bureau of Land Management, "Most of the historic activity in the San Gabriel Mountains has been related to mining. Placerita Canyon, the site of a gold strike in 1842, is located about 8 miles southwest of [the Lang area in Soledad Canyon]. Since that strike, gold, copper, iron, quartz and titanium have been periodically mined from Soledad Canyon." Mining sites tend to yeild more than one usable material; for instance, it is not uncommon for traces of gold and silver to occur among signifiant copper deposits. Situated along the Santa Clara River, the area of Soledad Canyon where the Southern Pacific Railroad erected Lang Station in 1876 is particularly rich in the types of sand and gravel used in road and home construction — although other materials are extracted there, as well. Iron and titanium are mined as secondary commodities, while tertiary commodities include phosphorus and phosphates. Among the minerals present are apatite, a phosphate; ilmenite, a titanium-iron oxide; and magnetite, a highly magnetic iron oxide. Sand and gravel may already have been mined from the site by 1921 when Sierra Highway was completed. Contemporary references indicate mining activity was under way in the 1930s, and various state mining reports record activity from at least 1948 onward. Throughout the latter half of the 20th Century, one of the major operators at Lang — roughly one-quarter mile east of the present-day 14 Freeway exit at Shadow Pines — was P.W. Gillibrand Co. The company was founded in 1957 by Philip Walton Gillibrand, an ex-construction worker from Tapo Canyon in Simi Valley. At Tapo Canyon, he began by mining and processing rock, sand and gravel to supply the construction trade and added high-quality industrial sand to the company's product line in the late 1970s. Gillibrand (pronounced JILL-a-brand) has mined not only sand and gravel in the Lang area, but also iron, titanium and phosphates. Gillibrand wasn't alone. In the late 1960s, the family of Placerita Canyon resident Ben Curtis — veterans of the construction aggregate business since the 1930s in Spokane, Wash. — moved to Southern California to build a batch plant for a client. In time, the Curtis family acquired a 185-acre property at Lang where sand and gravel had been mined since 1955. Included was a crushing, washing and screening plant built in 1969. As of 2012, Curtis Sand & Gravel extracts 300,000 to 450,000 tons of material per year from the Santa Clara River bed at its Lang Station Aggregate Plant, where it processes the sand and gravel into Portland cement concrete aggregates. In addition to Curtis and Gillibrand, operators in the area as of 2002 included CalMat/Vulcan, National Redimix (a concrete batch plant), Industrial Asphalt (asphalt plant), Lubrication Company of America (a former oil recycling facility) and a small topsoil supplier. Mining activity is performed under contract with the federal government, which owns the area's subsurface minerals. In 1990, the Interior Department's Bureau of Land Management awarded two consecutive 10-year leases which, if executed, would increase production levels in Soledad Canyon by roughly a factor of 10. The twin permits allow the lessor, Transit Mixed Concrete (which was subsequently acquired by Southdown Corp., then by Cemex), to extract 78 million tons of material to produce 56 million tons of concrete aggregates over 20 years. Curtis, who owned the surface rights to the 460-acre property (i.e., the land), had bid the federal contracts but was unsuccessful and now would have to watch another company mine that parcel. Curtis stymied Transit Mixed's efforts to commence mining. In 1998 the U.S. District Court affirmed the authority of Transit Mixed and the BLM to access Curtis' property, and the U.S. Court of Appeal upheld the ruling in 2000. The city of Santa Clarita entered the fray in 1999 when then-Mayor Jo Anne Darcy questioned the validity of Transit Mixed's contracts, as Curtis had done. The city waged a publicity campaign, filed an environmental lawsuit and pursued federal legislation to cancel the new mining contracts on grounds that the increased mining activity would harm air quality, clog roads and freeways with more gravel trucks, and threaten endangered fish and wildlife species. Along the way, in hopes of strengthening its legal standing, the city purchased the surface rights to the land from Curtis. "The size and scope of the mining project Cemex wants to locate in Soledad Canyon is far too large to be near more than 500,000 residents in the north Los Angeles County region," a city official said. Cemex chastized the city for "spending taxpayer dollars on a campaign of myths and nonfactual information." As of mid-2012, more than two decades after Transit Mixed received the go-ahead from the federal government, the increased mining hasn't happened — but neither has judicial or legislative relief. The fight continues. About the photographer: James Krause was a 20-year-old art and history student at San Fernando Valley State College (now CSUN) when, in February 1967, his family moved to 19549 Fairweather St. in Saugus — later called Canyon Country. After graduating in 1968 and aspiring to become a teacher, James worked at the Flare-Northern division of the Atlantic Research Corporation in Saugus, a defense subcontractor that manufactured explosive devices for Sandia National Laboratories in Albuquerque, New Mexico. Flare-Northern was located at 19701 W. Goodvale Road, in the hills west of the Krause home. Lucky for us, James enjoyed touring the canyons and shot numerous photographs from 1967-1970, focusing particularly on Soledad Canyon from present-day Canyon Country to Acton, and on its Southern Pacific Railroad features. He shot many of the photos in November 1970 while on leave from Vietnam. His teaching pursuits had been derailed; he entered the Army on Nov. 5, 1968, and went through basic and infantry training at Ford Ord, Calif., followed by NCO training at Ft. Bening, Geo. In October 1969 he served as a staff sergeant with the 101st Airborne Division in the northernmost part of South Vietnam, operating from the DMZ to an area near the Laotian border. In November 1970 he transfered to the 14th Armored Cavalry (later the 11th Armored Cavalry) in West Germany, patrolling the border with East Germany until his discharge in March 1973. By that time, the earthquake of Feb. 9, 1971, had hit the Santa Clarita Valley and his family moved away from Saugus. James' early interest in railroads was no passing fancy. Following his military service he joined the Union Pacific Railroad, first as a maintenance-of-way foreman for about a year and then as a locomotive engineer, a position he held until his retirement Aug. 29, 2011 (except for brief try at the restaurant business from 1992 to 1995). He drove trains in California, then Missouri and finally in Texas, where he lives as of 2012. He had three children with his first wife who, like James, was a Union Pacific Railroad engineer in Southern California. According to James, the UP believes they may have been the first husband-and-wife locomotive engineers in the United States.